Comments Off on PUBG Mobile guide Fear to land in a box? You have to go to these wild areas of the island. Landing into a box has become the most worrying issue for many novice players , in all major resource points are held by the gunmen of all kinds of guns today, Wanting to enter the mainstream resource point will undoubtedly make many players who are not good at shooting a way to end the game too early. In order to avoid the initial battle, most of the time we can also choose some wild areas, and sometimes there are many enemies in the wild area. Is there any position that can make us feel at ease? Talk about the wild spots in the game that are almost unmanned. The military base is a very fertile resource point. In general, the number of people at the point of the drop is relatively large, and the players who drop the points are mostly sharp. Want to take advantage of these players, the difficulty is not a star and a half. It is also because the military base is rich in materials and has a large number of points. Therefore, in many cases, the surrounding wild resource points are generally not available. 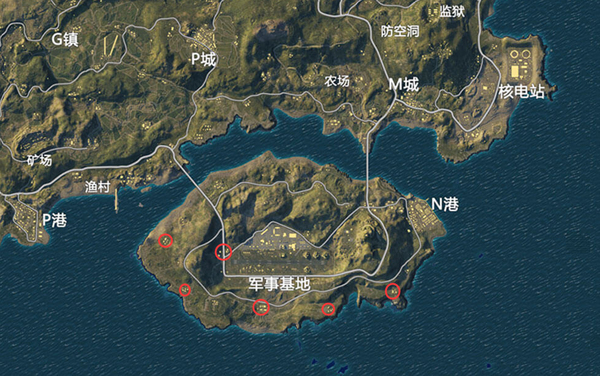 Players are either away from the military base or drop military bases. 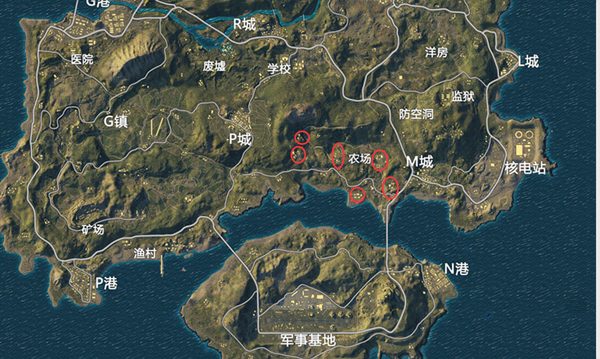 Players who like to play wild at this time can choose the wild areas around these military bases as shown below. The route is longer, but it is not too bad to search for equipment in a circle. There are still many players who may be worried about running the circle. This is generally considered when landing. Try to find the car first, then transfer it while driving. The problem of running the circle is not big. The only thing that needs to be worried is the problem of crossing the bridge. It is not good. You can find a boat. The southwestern wilderness we refer to here is between the town of G and the mine. 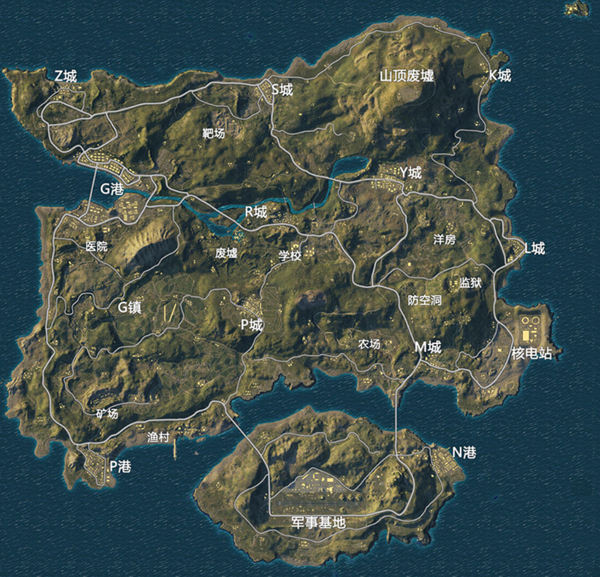 Relative to other areas of the island map, we can see that in addition to the G towns and mines mentioned above, there are basically no large resource points in the area, and almost all are small wild areas of different sizes. 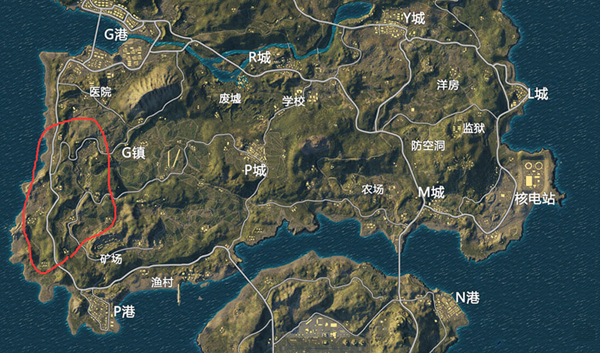 The 尬 area is relatively large in scope, the field area is numerous, and the distance between them is very far. The search requires a certain route plan, otherwise the search time is delayed. But the advantage is also very obvious, that is, the enemy is rarely encountered, even if it is encountered, because the regional terrain is complex, evacuation is very convenient. Farm is an island map There is a standard resource point on the standard. The sporadic wilderness area is relatively larger, and of course there will be a small number of players. But don’t worry too much. The same idea, landing first to find the car, incidentally observe the nearby room movement, whether there are open umbrella players, if you can drive to another wild area. The farm’s larger wilderness area is shown below. Generally, there are more enemies in the room near the bridge, so it is recommended to select the farm on the left side of the farm to search. Well, the above is the whole content of the island map wild area that has been brought to you. You are keen to play wild players and go to the game to experience it.